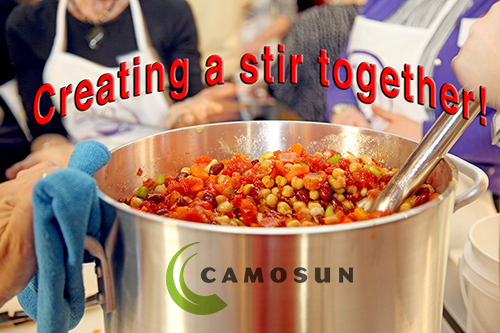 Soup Sisters Victoria is excited to announce our partner Camosun College and their Culinary Arts program. Together we will continue to support Victoria Women's Transition House. Since 1975 Victoria Women's Transition House(VWTH) has provided a safe and welcoming emergency shelter, respectful counselling and helpful services for women of all ages, with and without children, fleeing domestic abuse. VWTH offers an 18-bed shelter, 24-hour Crisis and Information Line as well as counselling and support programs for women, unique programs for older women, and specialized programs for children who witness abuse. In 2009, VWTH opened a 22-unit third stage housing complex for older women survivors of domestic abuse. Accommodation includes small, self-contained units where women can stay for up to three years with on-site supports. Each year, about 2,000 women and over 150 children and youth access Victoria Women�s Transition House programs and services. More than just safe housing, Victoria Women�s Transition House is a place of hope and renewal. The Society strives to prevent and eliminate abuse through education, advocacy and partnerships. Events are scheduled once a month on Wednesday evenings from 6:00 p.m. to 9:00 p.m. and accommodate groups of 16 to 24. Extra events may be added on special request. The Professional Cook Training program at the Camosun College Interurban campus is a recognized and highly successful Canadian Red Seal designated training centre. Alumni from this program have ascended to the very top of the food service industry and beyond. Soup Sisters participants will experience working in a professional teaching kitchen led by a certified chef instructor. By teaching and applying industry standards to this exceptionally worthwhile initiative through it�s participants, the whole team at Culinary Arts hopes to improve the lives of women and their children across our region. Soup Sisters charges a $55 participation fee per person to cover the expenses of ingredients for the soups, the venue, clean up, equipment, supervision, and a Chef. This ensures that the finest ingredients possible are used every time for the soups we provide to women, children and youth. Events are social evenings with lively conversation, chopping, laughter and warm kitchen camaraderie that culminate in a simple, sit-down supper of soup, salad, bread and wine for all participants. 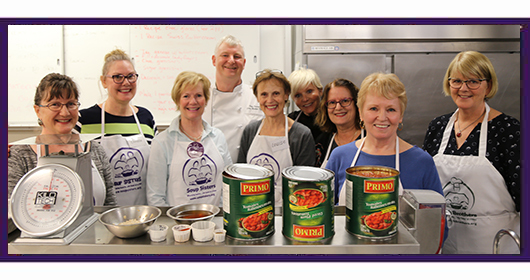 Each event produces approximately 150-250 servings of fresh soup that sustains Transition House with nourishing and nurturing soup each month. Go to the Bookings page now to find a date that works for you.